Tag line: "THE MAN You'll Never Forget!" The Man from Laramie marked director Anthony Mann’s first experience with Cinescope, a widescreen format introduced in the early 1950’s. By filling the entire screen with action, Mann took his western in a completely new direction, and within his typically well-composed tale of drama and intrigue introduced a little bit of art as well, providing his audience with the added bonus of breathtaking imagery to go along with a story they could sink their teeth into. Will Lockhart (James Stewart) has spent a great deal of time searching for the man who murdered his brother, even though he’s not entirely sure who that man might be. Knowing only that the killer trades guns with the Indians, Lockhart travels to Apache territory in the hopes of catching a break. Once there, he runs afoul of the bad-tempered Dave Waggoman (Alex Nicol), son of powerful rancher Alec Waggoman (Donald Crisp). Left wounded by the run-in and forced to stay put for a while, Lockhart soon finds himself square in the middle of a family squabble, with Dave Waggoman going up against his adopted brother, Vic Hansbro (Arthur Kennedy), for control of their father's vast estates. 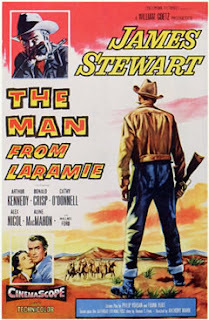 The Man from Laramie has many of the elements you'd expect to find in an Anthony Mann western, where vigilante justice is preferable to law and order and family members fight each other for control of a piece of land. Throw in an extra wide screen, and you have a movie that is truly unforgettable. With the hep of his Director of Photography, Charles Lang (who received 18 Academy Award nominations over his 47-year career), Mann utilizes every inch of his available canvas to relate this story of deception and revenge. From the opening scene, where two horse-drawn wagons make their way across a desert landscape, it’s obvious the director plans to take full advantage of the Cinescope format, and even the sudden moments of violence are stylized, like when Lockhart, on his first meeting with Dave Waggoner, is roped by one of Waggoner’s henchmen and dragged ten feet across the dirt and sand. It’s a terrible sight, to be sure, yet thanks to Cinescope, it's also quite spectacular. The Man from Laramie is an example of an artist working within a genre he is wholly familiar with, while at the same time employing technology that's entirely new to him. The result is a film of incredible power, not to mention incredible beauty.